PENDANT WEIGHT : 2.75 CARATS. QUANTITY - 1 PIECE PENDANT. STONE WEIGHT - 0.80 CTS. STONE SHAPE - OVAL. STONE SIZE - 7x5 mm. GEMSTONE - TANZANITE. QUANTITY - 1 PIECE PENDANT. PENDANT WEIGHT : 2.55 CARATS. STONE SHAPE - OVAL. STONE SIZE - 4.50X6.50 mm. STONE WEIGHT - 0.70 CTS. 14k Solid Yellow Gold Cute Cross Pendant with Mix Stones. Shape of Stones: Round. Style: Cross. Total Weight: 2.05 Grams. PENDANT WEIGHT : 2.30 CARATS. QUANTITY - 1 PIECE PENDANT. STONE WEIGHT - 0.80 CTS. STONE SHAPE - OVAL. STONE SIZE - 7x5 mm. 1 CARAT TANZANITE, BLUISH-VIOLET COLOR. 14K YELLOW GOLD. JEWELRY TYPE. WE PROVIDE FREE RING RESIZING. Signature Required Service for security purposes. This beautiful pendant features a genuine carved mother pearl Virgen Milagrosa (Miraculous Virgin) design that dangles playfully from a genuine 2.5-3mm cultured pearl link attached to the 14kt yellow gold bail. STONE WEIGHT - 0.90 CTS. PENDANT WEIGHT : 2.90 CARATS. QUANTITY - 1 PIECE PENDANT. STONE SHAPE - OVAL. STONE SIZE - 7x5 mm. Very beautiful Victorian style 18k solid yellow gold Dendritic Moss Agatependant. Pendant size approx. : 25 20 MM (1" 0.79"). GEMSTONE - CORAL. STONE WEIGHT - 1.25 CTS. PENDANT WEIGHT : 3.05 CARATS. QUANTITY - 1 PIECE PENDANT. STONE SHAPE - OVAL. STONE SIZE - 7x5 mm. Featured of Stones: 100% Natural Sapphire. Style: Diamond Shape. Total Weight: 4.30 grams. Shape of Stones: Marquise. Stone Information. 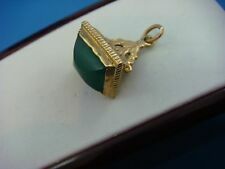 14k Solid Yellow Gold Natural Green Jade Lady Buddha Pendant Charm. Natural Lady Buddha Green Jade. 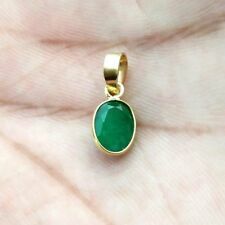 Total weight Jade n Gold: 7.77 grams. Jade, size: 35mmX15mm. This beautiful pendant features a genuine carved mother pearl thinking angel design popularized by the Italian Renaissance artist Raphael. The cherub dangles playfully from a genuine 2.5-3mm cultured pearl link that is attached to the 14kt yellow gold bail. Width: 21 MM widest point. Total stone weight: 14.5 Ct, Center stone size 18×13 MM. This exquisite heart-shaped pendant is made of 14K yellow gold and set with genuine fine pink sapphires and diamonds. New York's very own Diamond District. The pendant can accommodate a thick or thin chain. Style: Rectangle Cluster. Featured of Stones: 100% Natural Sapphire. Stone Information. PENDANT WEIGHT : 2.10 CARATS. QUANTITY - 1 PIECE PENDANT. STONE WEIGHT - 0.80 CTS. STONE SHAPE - PEAR. STONE SIZE - 7x5 mm. Total item weight 3.0 grams! Pendant Length is 44.0mm. "For Fine Jewelry and Carvings". Top Rated SellerFrom United StatesMetal: Yellow GoldStyle: PendantLength: Less than 13"
Blue Topaz & Diamond 14k Yellow Gold Adjustable Necklace With 18" Anchor Chain. Featured of Stones: 100% Natural Sapphire. Total Weight: 3.50 grams. Style: Round Shape. Shape of Stones: Marquise. Stone Information. ROUND ONYX. 14K YELLOW GOLD. LARGE PENDANT. JEWELRY TYPE. Signature Required Service for security purposes. Style: Diamond Shape. Total Weight: 2.30grams. Shape of Stones: Round. Stone Information. Style: Rectangle Cluster. Stone Information. Shape of Stones: round n marquise. Style: Cross. Number of Stones: 6 pieces. Stone Information. Feature of Stones: 100% Natural Sapphire. Style: Diamond Shape. Total Weight: 2.68 grams. Shape of Stones: Round. 14k Solid Yellow Gold Cute Dangle Pendant with Natural Sapphire. Style: Dangle. Featured of Stones: Natural Sapphire. We are soul goes into everything we do. Everyone now can afford the beautiful jewelry that you alway dream of. Featured of Stones: 100% Natural Sapphire. Shape of Stones: Oval 4x3mm. Stone Information Total Weight: 2.67 grams. Featured of Stones: 100% Natural Sapphire. Style: Cross. Number of Stones: 6 pieces. Total Stones Weight: 1.50 Carat. Shape of Stones: round n marquise. Tourmaline increases flexibility, happiness, objectivity, compassion and serenity. It also enhances tolerance and understanding. It is a stone that is very helpful for channeling. Tourmaline is also a very protecting stone. Style: Two rows. Featured of Stones: 100% Natural Colors Sapphire. Stone Information. GEMSTONE - TOURMALINE. STONE WEIGHT - 0.70 CTS. PENDANT WEIGHT : 2.60 CARATS. QUANTITY - 1 PIECE PENDANT. STONE SHAPE - OVAL. STONE SIZE - 7x5 mm. Feature of Stones: 100% Natural Sapphire. Style: Cross. Total Weight: 2.0 Grams. Style: Cross. Total Weight: 2.03 Grams. Product Information. Style: Cluster. Featured of Stones: 100% Natural Colors Sapphire. Stone Information.